Whenever Chef Que Vinh Dang gets upset his macaroons crack. “It’s the same recipe, same measurements, same everything,” he said. “I don’t know why, but when I’m mad, they come out all wrong.” Good thing we visited when he was happy. So instead of harbouring resentment over Hong Kong’s shallow food industry, he set out to fire bomb it. After some soul searching in New York, he moved back to Hong Kong to start afresh. And the product of his sabbatical is TBLS (tablespoon abbreviated), located in an old nondescript building on Hollywood Road. You’ll need a door code to enter. Here, around 12 seats are set on the sides of the large open kitchen. 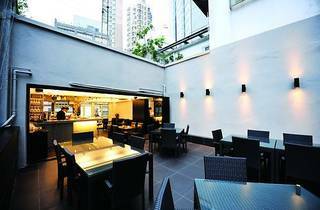 Outside, a balcony holds more tables with views of IFC and the towers of Soho. Both rooms are sparse, filled with mass-produced chairs and tables and dark woods, but not much else in way of décor. There are plans to hang meshed-up New York and Hong Kong street murals on a wall begging for something. But since he’s emptied his bank account to start this place, the concentration has to be on the kitchen for the moment. Six courses, at $480 per person. There is only one menu. And with this, Dang proves his talent with a playful comfort food menu that takes a shot at the fine diners he has come from. For example, he makes chicken nuggets, serves it on toasted brioche and pairs it with a cup of mushroom essence – a soup and sandwich combo. The amuse-bouche comes out and my dining partner takes the short rib cube with pickled daikon served on a large silver spoon into her mouth and says, “I think I just came.” The flavours are that of a bánh mì sandwich, only tight, concentrated and refined. Technically, Dang is brilliant, and not afraid to try anything – great qualities to have in a market so desperately seeking fresh ideas. Because of the size of his kitchen and the limited number of seating the chef can accommodate in one evening, he can be very personal with his guests. A plate of brown cubes arrives and he asks us to guess what they are. Some sort of cheese on toast was the closest we got. Almost. It was the rind of parmesan cheese pan-fried. When rind is heated, it becomes soft like bread, the oil of the cheese separates and softens as well. This was his version of a grilled-cheese sandwich. Various witty dishes arrive: wagyu oxtail and Iberian chorizo lasagna; a slow poached salmon with every part of a celery stalk used in the sauce or puree. Braised short ribs makes a reappearance, this time with creamy polenta and sous vide endives. Everything is in small individual portions and builds to a crescendo like a good song. Speaking of songs, you won’t hear any dreamy bossa nova, or lyricless easy listening. No, this guy’s from New York. He blasts Jay-Z, Alicia Keys, Common, Pharrell, and Kanye West throughout dinner. And this gets his young and handsome staff pumped. 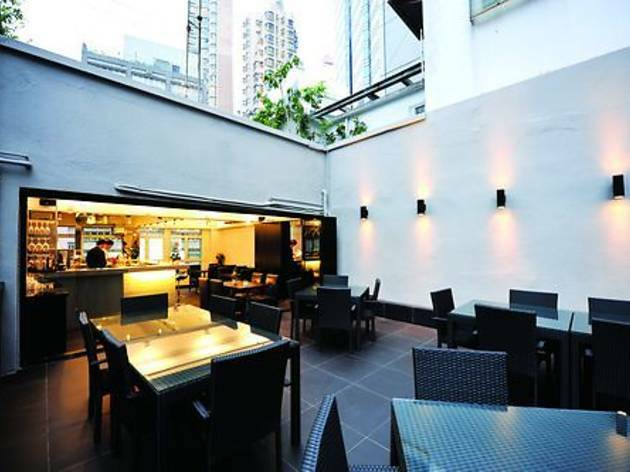 7/F, 31 Hollywood Rd, Central, 2544 3433. Mon-Sat 6pm-11pm.